The DB Series vibratory finishing machines are designed as regular use tub vibrators. These finishing system machines make great “starter” machines for those unfamiliar with mass finishing or on a limited budget. 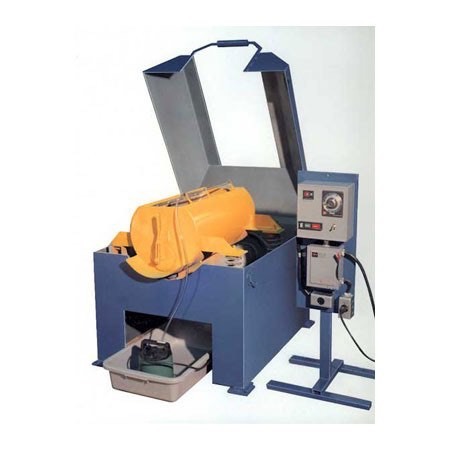 The vibratory tumbler is typically used for deburring and polishing operations. A DB Series vibratory finishing machine is constructed of heavy-gauge steel and rust-preventive enamel paint. Each of the tub vibrators are lined with durable polyurethane. All systems come equipped with a complete fluid recirculating system. A variety of optional Tubular Rotary Separator Attachments can be easily attached to the DB tub outlet. 31" x 131/2" x 13" 35" x 18" x 183/4"
Available in 220 Volt @ 50Hz. Heavy-Gauge Steel Construction Coated With Rust-Preventive Enamel Paint.